The Palestinian refuge has undergone a long and violent displacement — beginning with the 1948 and 1967 Arab-Israeli wars, with continuing secondary and tertiary violent displacement today — due to a precarious geography within which it resides. Addressing spaces of refuge (refugee camps), especially as architects, has become quite a complex issue, mainly due to a protraction of refuge (including people and space), which resulted in the emergence of scenarios of inhabitation that surpass and transgress the established relief space by international and government bodies. 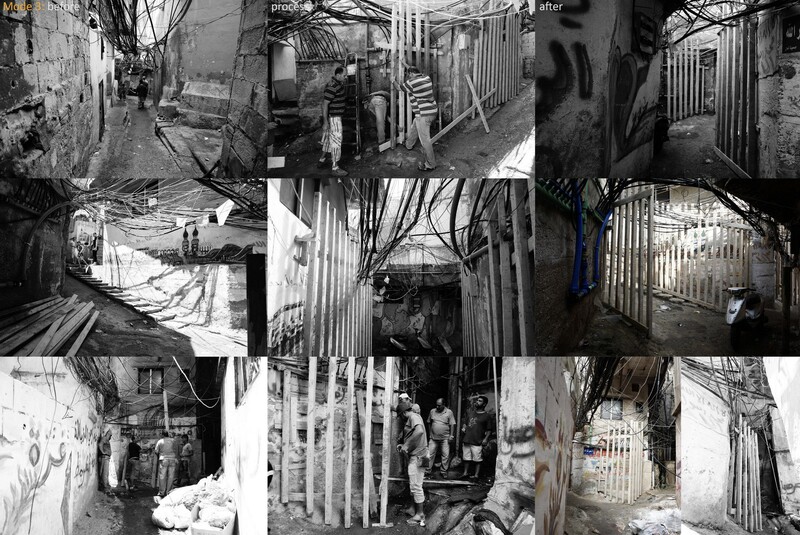 After conducting my research and fieldwork in both Baqa’a camp in Jordan and Burj el Barajneh camp in Lebanon, it became quite clear to me that the spatial precursor to the existential testimony of Palestinian refugees today was their space-scale, built and formed by the refugees themselves, and at the same time, rebuilt and re-formed by the host governments. From the onset, theses sites (camps) were perceived as relief sites by the United Nations Relief and Works Agency for Palestine Refugees in the Near East (UNRWA) (with the goal of resettlement), and as resistance sites for Palestinian refugees (with the goal of returning to their homeland). Today, and due to the prolonged state of refuge, the mode of resistance has taken on a purely spatial form. 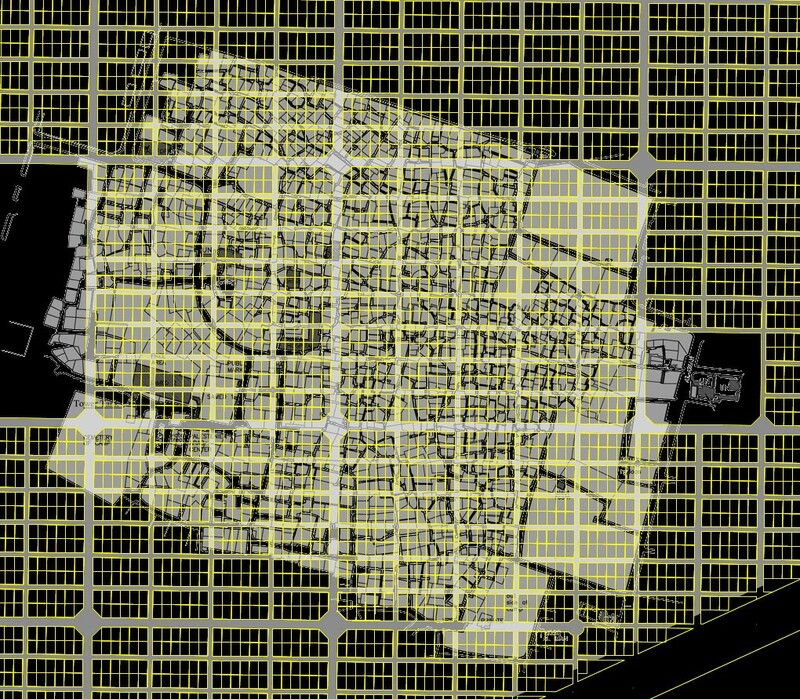 The following mapping tries to demonstrate the elastic and operational notion of spatial resistance inside the Palestinian camp, by which they were able to empower themselves politically, and negotiate an uncertain existence of refuge. 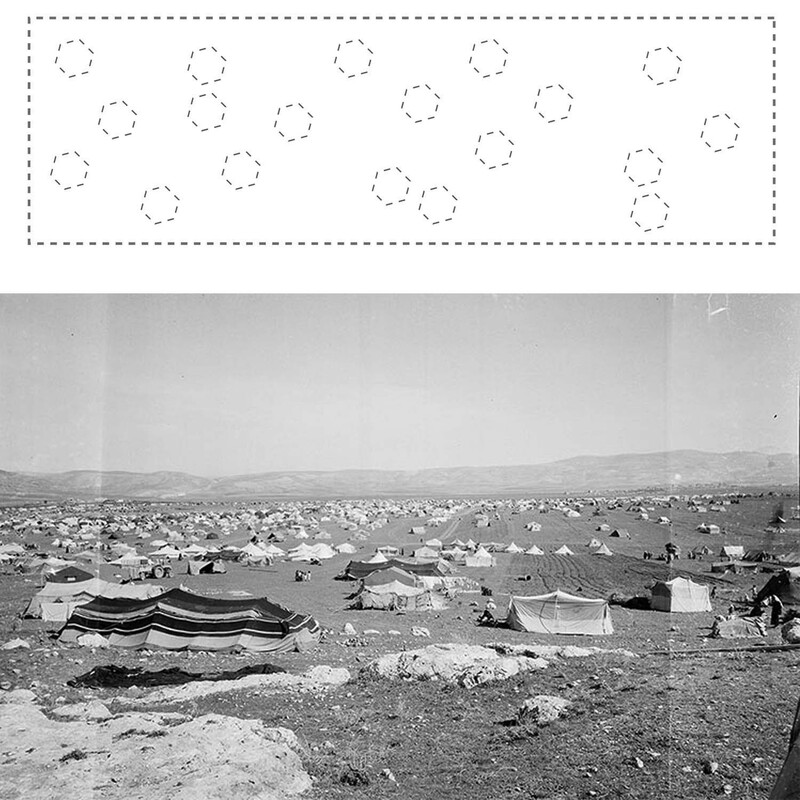 1948 camp layout: The onset materialization of the Palestinian camp was embodied in a relief, haphazard layout of tents on a defined boundary. Each refugee family was entitled to a tent, and each tent correlated with a refuge number, which entitles the refugee family to relief services inside the camps, and guarantees their inclusion within the UN’s political categorization of refugees. 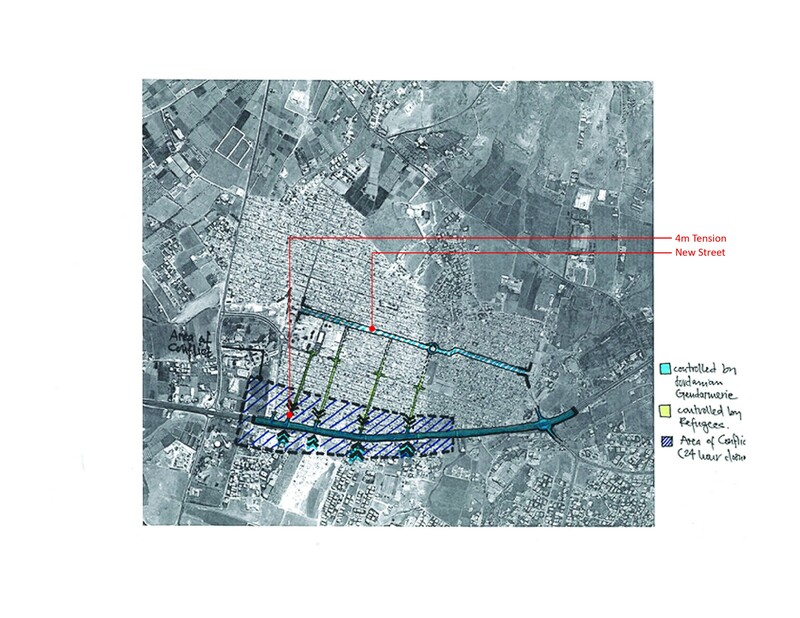 1950s camp layout: Within a few years of living in the camp, UNRWA laid a new grid plan for each camp consisting of 96 100-square-meter plots, housing within them a 12-square-meter room (with no water or sanitation), made of prefabricated asbestos sheets, and zinc roofing. 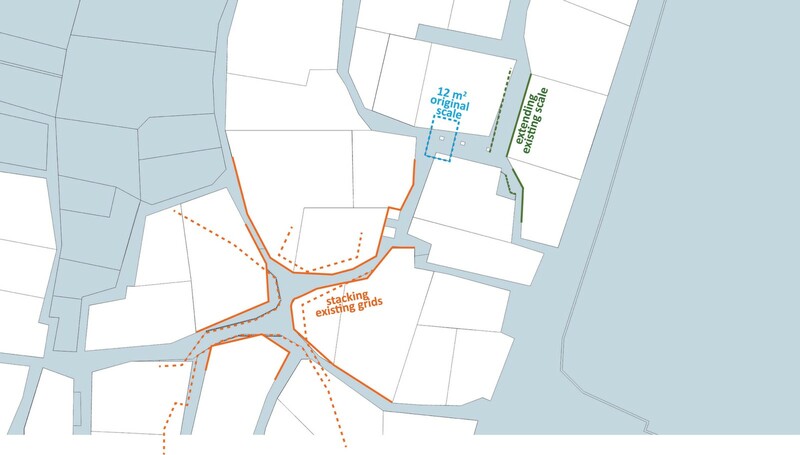 This plot is the area granted as personal “right-of-use” to each refugee family. Anything built beyond this 100-square-meter “right-of-use” line would be considered a spatial violation. 1960s–1970s camp layout: During this period, and correlating with the established presence of the Palestinian Liberation Organization (PLO) inside Palestinian camps, as sites for planning and managing the liberation of Palestine, concrete was pouring into the camps (often subsidized by the PLO) to ensure that refugees quickly met their existential needs and could focus on achieving their emancipation. 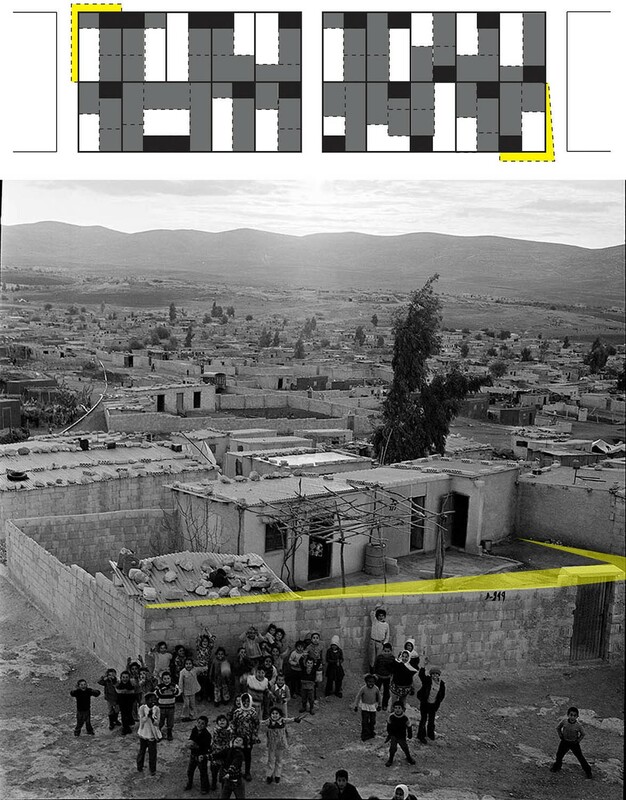 This led to a rapid transformation of asbestos to concrete, and the first application of spatial violations, through realigning the walls beyond the 100-square-meter “right-of-use” plot demarcation (in yellow). Spatial production would quickly become a refugee product. 1970s camp layout: As the 100-square-meter “right-of-use” plot boundaries gradually filled up with concrete rooms, concrete would start to overflow beyond the wall in the form of thresholds. 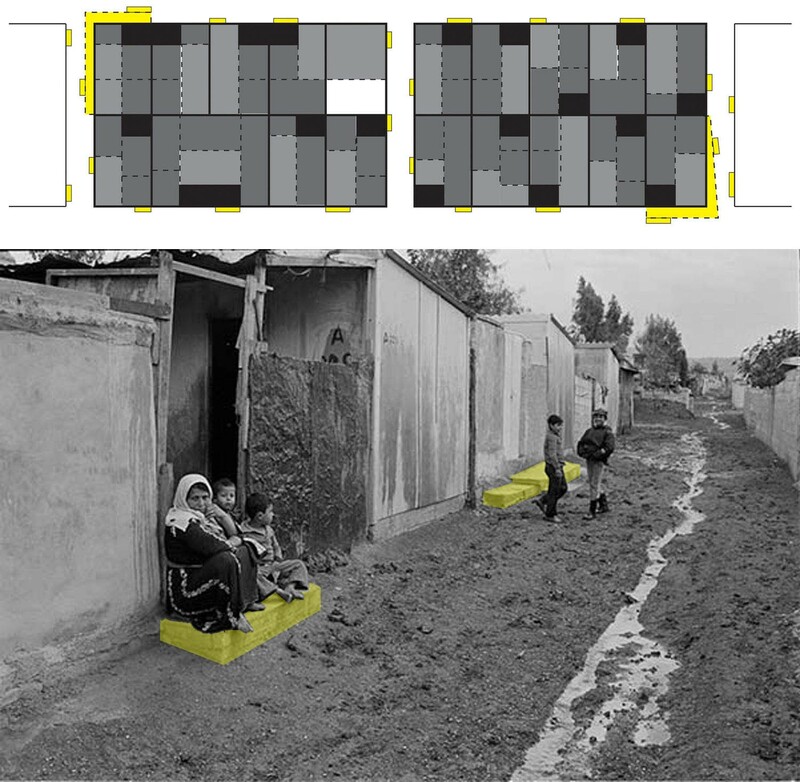 These thresholds (Attabat), where concrete as “excess” appears, are utilized to keep the muddy waters from seeping into shelters, and provide an outdoor social space. They would become the first “architectural-element” to facilitate the changing scale of the camp. 1980s–1990s camp layout: As the horizontal planes became saturated with cement, the refugees devised another “architectural element” in the form of external stairs to facilitate vertical expansions, or vertical spatial violations. The external stairs are initially constructed out of temporary material, reserving the new encroached-upon space until it gradually morphs into cement. This material transformation is the moment when the demarcated “right-of-use” plot is truly delineated and redefined. Today’s camp layout: Today, and after 68 years of continued refuge, the Palestinian camp as “space,” and the Palestinian as “refugee,” remain in a relationship that is co-constitutive. Yet, and due to acts of spatial violation, this relationship remains in flux and continuously re-scales itself proportionally to economies of inhabitation and disputes of political refuge. The “deviation” beyond the 100-square-meter plot lines, embodied in acts of spatial violation, is the actual disruption to the “relief scale,” planned as a spatial conduct of organization, surveillance, and control of the camp space. With every act of spatial violation, there is an act of political instrumentality happening at the same time, for as soon as the relief scale is relegated, it becomes a Palestinian one, and the refugee becomes less docile in that space. A main difference between humanitarian architecture and refugee architecture is that the former assumes order through ordered generic space, while the latter creates its own ordered space. Embodied in the spatial disruption of the relief-scale through acts of spatial violation, this disruption contributes to the generation of a new order facilitating the socio-politics of everyday life, yet this new order has violence inscribed in it, as it remains exposed to the threat of destruction by external bodies (mainly host governments) to maintain spatial control. The following mapped scenarios are testaments to refugees’ authority and management inside their camps, through a spatial capacity produced by the refugees themselves, yet existing in latent fragility due to threats of violent acts of destruction. Confrontations between Palestinian refugees and the Jordanian gendarmes are common in Baqa’a camp, usually resulting from refugee collective protests, which take place inside the camp but eventually trickle outside camp borders to physically signify dissatisfaction and refusal of a status quo. Map showing the programming of space in Baqa’a camp during confrontations with Jordanian gendarmes. The gendarmes retain a confining position along the main road (in solid blue), while the refugees close camp entrances along the main road by placing burning tires, thus creating an un-intruded area, while engaging in verbal and stone throwing scuffle with the gendarmes within an un-intruded four-meter space toward the camp. Within this four-meter tension space, a violent game of name-calling and stone-throwing (from the refugees’ side) and tear gas canisters (from the gendarmes’ side) would take place, lasting until one side retreats out of exhaustion. Nevertheless, gendarmes had reservations about entering the camp because of its dense fabric/scale (of space that) refugees produced continuously beyond the (UN) demarcations. Jordanian gendarmes felt disadvantaged inside the camp, as they were inexperienced with the camp’s spatial fabric, making attempts to arrest refugees unsuccessful. The existing scale of Palestinian camps, which hinders the government’s control over space, has forced the Jordanian government to negotiate “security” with camp leaders after conflicts take place. Recently, as a response, the Jordanian government has been adopting a mode of “rescaling” the Palestinian camp by widening existing streets that divide the camp through its middle, creating a matrix of roads at a new scale that allows for the quick entry of police and gendarme tanks into the very tissue of the camp, something the camp’s dense fabric has prevented them from doing before. On a summer night in August 2015, a demonstration took place in Baqa’a camp in support of Mohammed Abu Khdeir, the 16-year-old Palestinian boy who was kidnapped and burned alive by three Israeli settlers. The demonstration turned violent, and ended in the usual act of refugees burning tires at camp entrances, weakening the gendarmes’ capacity to penetrate the camp. Yet due to the Jordanian government’s rescaling of the camp, the gendarmes penetrated the camp in their tanks, and engaged in the chase and persecution of arrested refugees. The Palestinian refugees in Lebanon underwent a violent history of existence and cohabitation, resulting in a long period of armed conflict. The worst period was the War of the Camps, during which Burj el Barajneh camp suffered a six-month siege, and heavy fighting with the Lebanese Amal militia. Confined to their camp boundary, the Palestinians had to utilize their space and spatial material to develop tactical solutions, one of which was the production of elevated walkways. 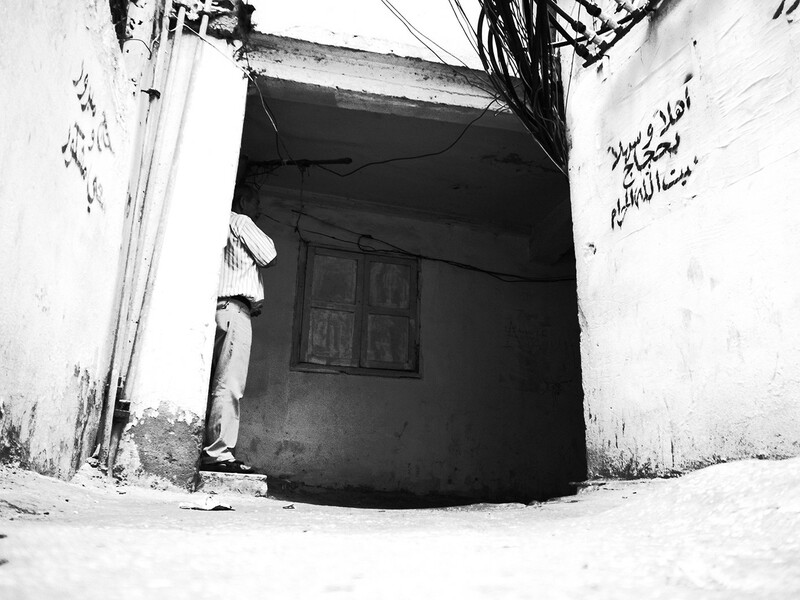 The Lebanese context has been the harshest among the five host areas for Palestinian refugees, mainly due to a violent history within Lebanon itself, and the onset refusal by the Lebanese government to grant Palestinians any civil rights. This oppressive sentiment led to the creation of highly dense, independent camp-spaces. Unable to penetrate the fabric of the camp, the Lebanese government devised a spatial practice of confining camps by building highways and elevated highways around them, hindering contextual accessibility. 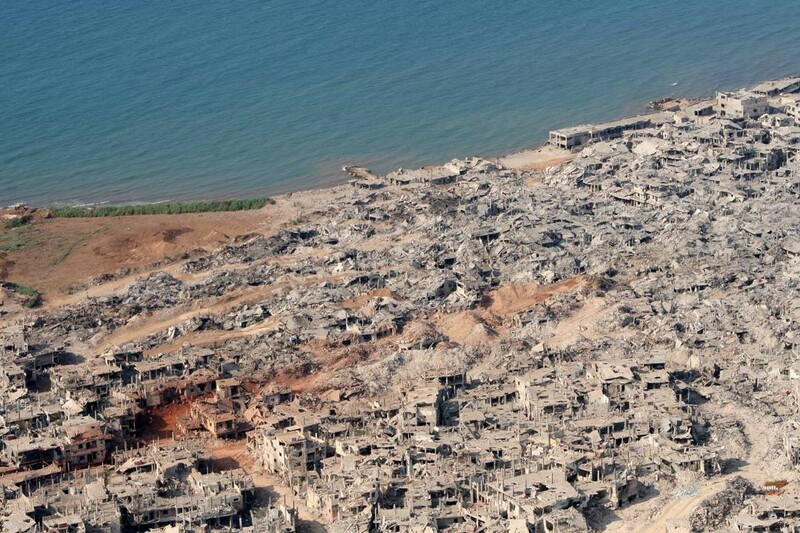 The other spatial approach has involved extensive destruction, by completely demolishing camps in scenarios of conflict — the most recent example of which was Nahr el Bared camp in northern Lebanon, which was completely destroyed in 2007. 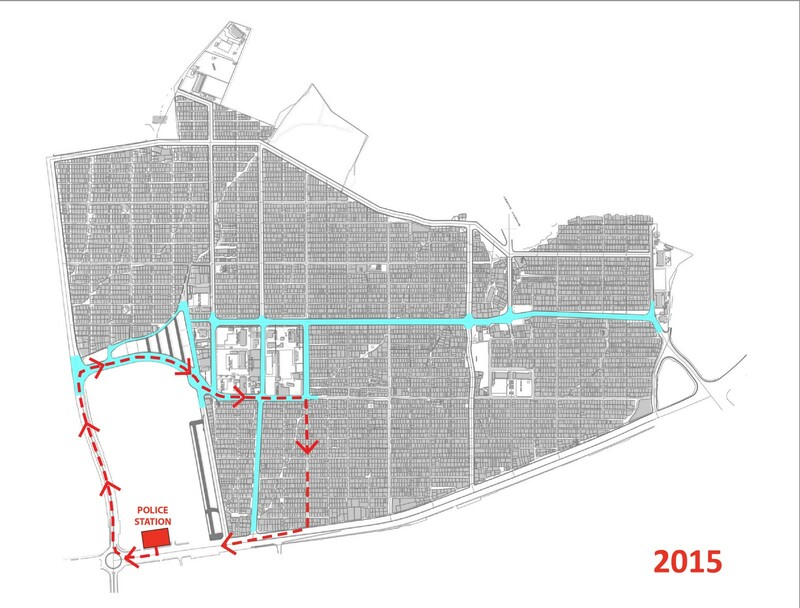 During the reconstruction negotiations with the Lebanese government, plans to relocate the displaced refugees to another Palestinian camp, as Nahr el Bared occupied a prime investment location near the ocean along a main road, failed, due to refugees’ anger and unbroken determination to return to their camp and spaces (which UNRWA used as a key argument in securing their return). Today, and after the destruction of more than four Palestinian camps in Lebanon, Burj el Barajneh camp remains the densest camp, located just outside of Beirut, in close proximity to the ocean and along the airport highway. This very strategic and attractive site for private investors leaves it at high risk of conflict and destruction. During my fieldwork and discussions with refugees in Baqa’a camp and Burj el Barajneh camp, it became clear that a physical intervention under the auspices of remedy or humanitarian aid would prove ineffective inside a space where architects blush as they look around and amaze themselves with the genius of refugee architecture, and its ability to adapt and grow within its complex material context. The question clearly emerged as: How can we create a spatial intervention with the aim of transferring space and knowledge? The politics inside Palestinian camps takes on various forms, yet due to the protraction of Palestinian refuge inside camps, the political is most empowering and violent when it is spatial, meaning that space and space-making is what truly provides refugees with negotiating means with their host governments. We can claim here that the political has become a “scale,” a spatial scale inside the camp, produced once refugees transgressed boundary lines, enabled through acts of spatial violation. The interventions were meant to negotiate space through space-making by constructing a spatial installation which directly addressed “scale” and “production of space,” thus engaging in this transfer of space and knowledge. 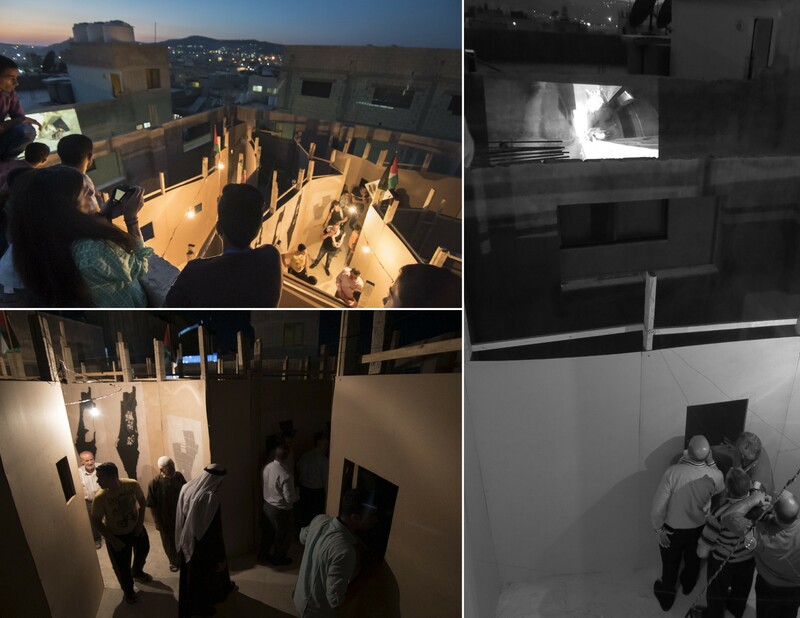 The installation literally superimposes two camp-scales to produce a hybrid third, one that can act as an agent for “transferring space and knowledge,” and have the potential to proliferate into a new order of “power-relations.” Constructed inside both Baqa’a and Burj el Barajneh, the installation reveals the narrative of spatial production and refugee/host government relationships using spatial means. The spatial superimposition was based on a map overlay of the two camps, both scaled to the same scale. 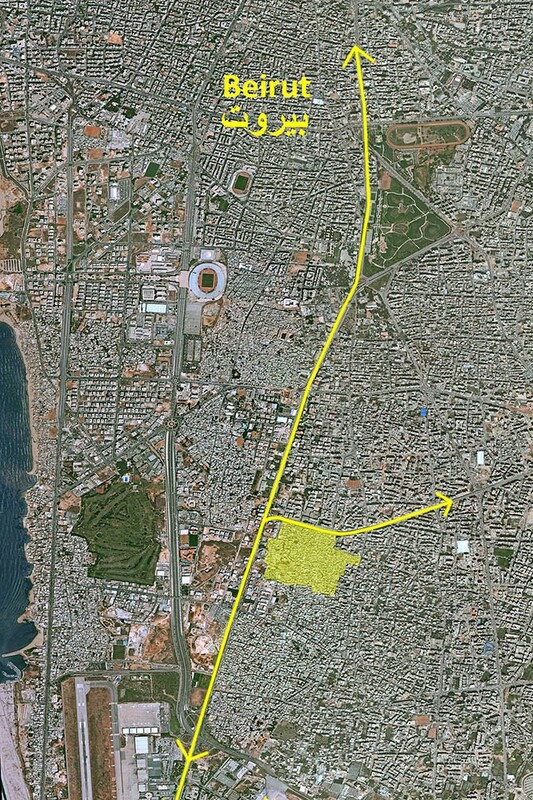 Baqa’a camp’s spatial scale (in yellow) still largely retains UNRWA’s grid layout of 100-square-meter plots due to the Jordanian government’s control over space inside the camps. Yet in Burj el Barajneh camp, and due to the government’s invisible role inside the camp’s space, the scale has reached a density beyond any visible “humanitarian boundaries.” The superimposition of maps clearly shows the intense encroachment and utilization of space in Burj el Barajneh camp, as compared to that of Baqa’a camp, whereby one yellow shelter plot in Baqa’a camp can contain multiple shelters from Burj el Barajneh camp. 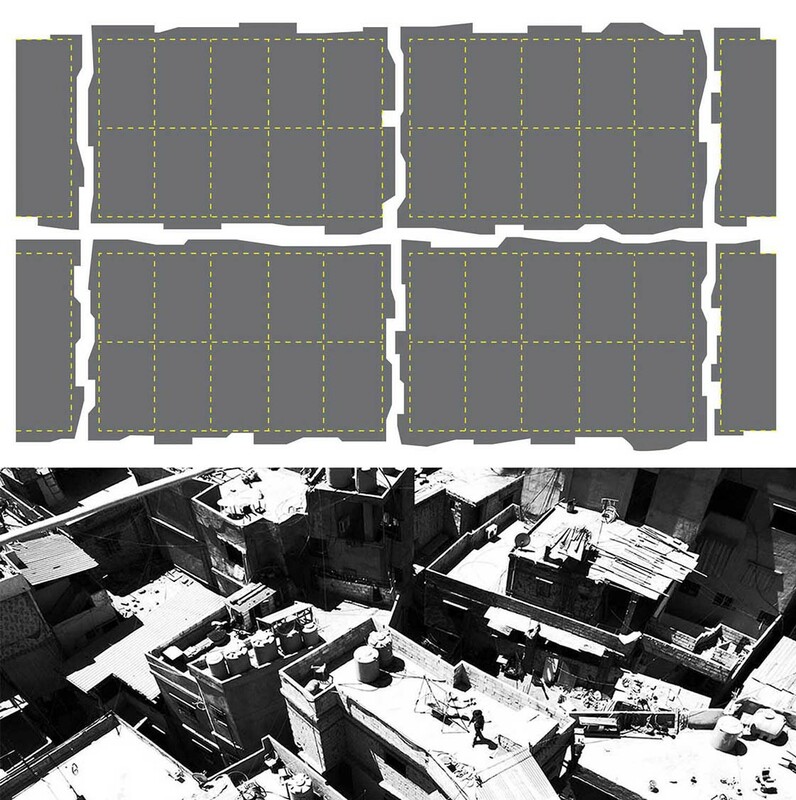 The idea was to promote a spatial dialogue by re-creating a spatial scale, taken from Burj el Barajneh camp, and rebuilt within Baqa’a camp’s spatiality, to begin a negotiation based on what the Palestinian camp’s spatiality really means on the ground, and what scale it needs to reach to provide the optimum negotiating agency for the Palestinian refugees, one which is very much political, including the creation of new terms with host governments. 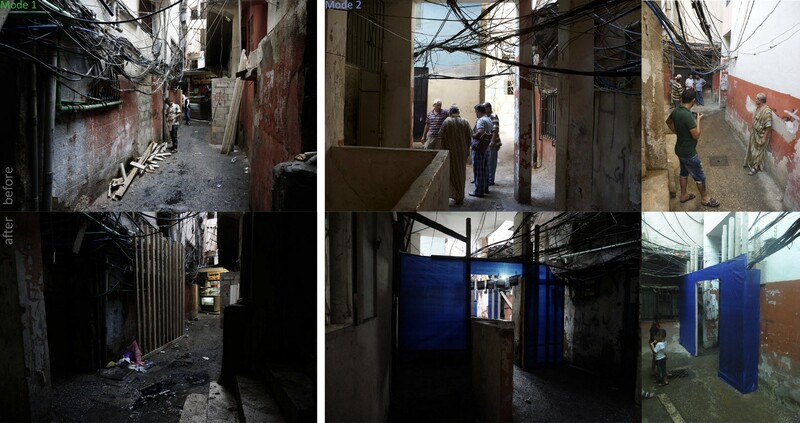 The initiative was meant to transfer space and knowledge from Burj el Barajneh camp into Baqa’a camp in the form of an installation, including material data that address Palestinian camp-spaces on a larger scale by integrating spatial maps and spatial documentaries into the installation, whereby refugees are able to walk around the new scale and engage with the material. Films were projected on adjacent building walls in an attempt to employ another form of superimposition, one that directly uses the camp’s existing material-form. 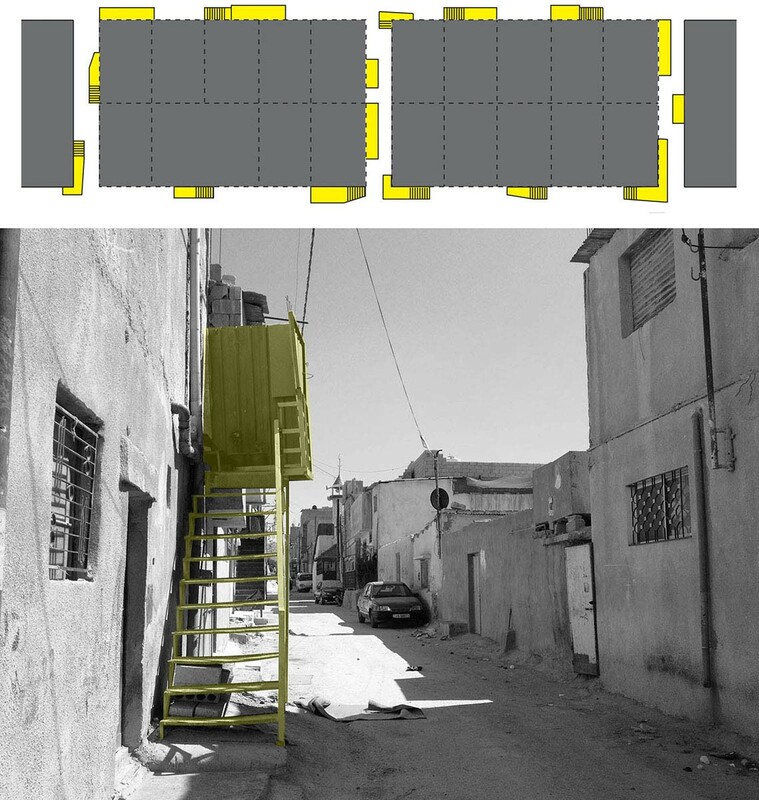 In Burj el Barajneh camp, the installation needed to be built on the ground in a common area, which has a pragmatic and continuous daily use. This obviously being to produce a superimposition of scales which could not only define the existing scale with a set of existing spatial knowledge, but offer new knowledge emanating from the existing one, which allows for the production of new spatial scenarios and potentially new subjectivities. By constructing new scales — in the form of installations — on existing ones, not only is the existing form interrupted, but the existing spatio-movement and circulation are altered as well, forcing the inhabitants to address the intervention as part of their daily inhabitation of the camp. Different modes of scale-superimposition were utilized as part of the installation. 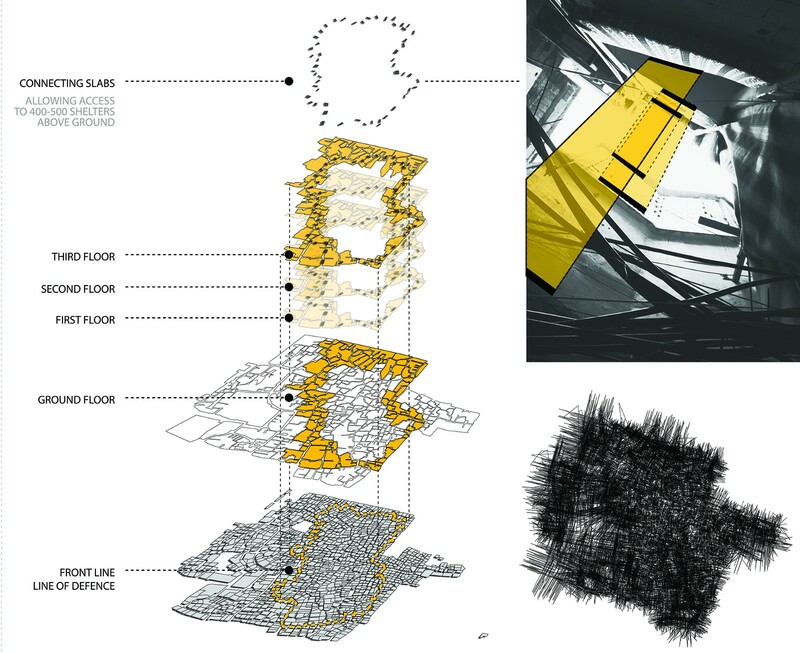 Mode 1 was based on extending the existing scale (form lines) to project a future scenario of increased space. 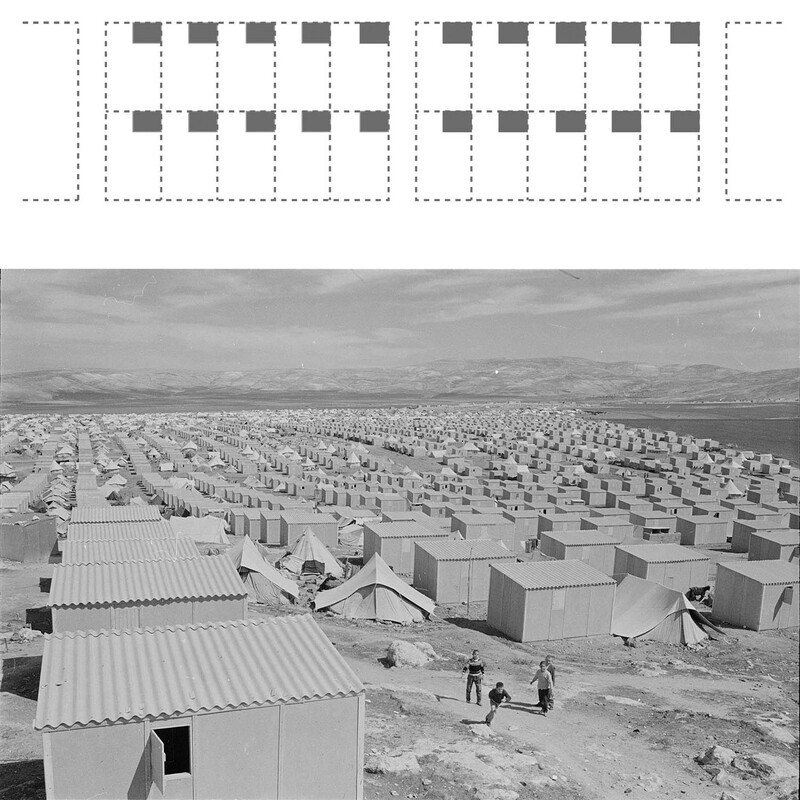 Mode 2 was a superimposition of the “original” UN scale the camp started from — which was the 12-square-meter (3 x 4) zinc room UNRWA provided for each refugee family — over the existing camp-scale. This retraction to the original “applied” scale-form in the camp allows us to retract our spatial dialogue to that first moment of scale-making, and demonstrates a superimposition of an “original” scale of efficiency, control, and surveillance over that of protracted refuge, organized armed struggle, and resilience. Mode 3 involved a more clearly Foucauldian exercise of stacking the existing grid onto itself while applying a “shifting,” to intentionally mask (cover) certain areas on the ground and reveal new ones in the form of new, potential space. When established, these camps were a visible humanitarian crisis (in the form of displaced refugees and space) that ensured political mobilization (and here I mean International aid as well) toward not only addressing the problem but intervening in it. Yet, after 68 years of protracted refuge, the refugees proved to be independently resourceful, and successful builders, consequently camouflaging the crisis. So, if there is to continue to be a political dialogue and intervention, there must be a crisis — a visible one. I believe today “space” remains a crisis, more than the refugee as “political/non-political” being. As long as space remains in crisis, the political remains negotiable. And here I do not mean the crisis of dilapidated space or threatening infrastructure (without undermining its seriousness), but the crisis here is less humanitarian and more political, where space is a threat, both violent and economical. In some Host Countries, straw-mud or zinc sheets were used for constructing the 12-square-meter room walls.